An ideal binder for moist based foods. Simply heat food ingredients to 30° C and gelatin will melt into the ingredients. 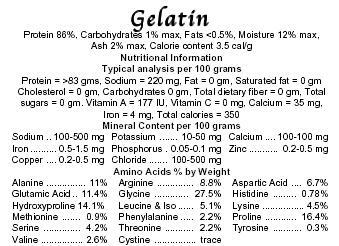 Usually 3% to 7% gelatin, depending on ingredients used and liquid content. Will bind food together underwater for 3 to 8 hours. Moist binding of foods helps reduce water pollution due to excess food particles. Food can be prepared, frozen, and defrosted without loss of binding characteristics of gelatin. Edible grade.